This past Sunday I decided, somewhat last minute (and with definite encouragement from Yvonne), to go up to the Park Avenue Armory and check out the last few hours of the AIPAD show. AIPAD stands for the Association of International Photography Art Dealers. As the name suggests, it's basically a big gathering of many of the world's top photography galleries. Imagine an indoor sports arena filled with about 80 exhibitor booths, all immaculately decorated with gorgeous photographs of every genre imaginable. My only reluctance in going at all was that I would have to fork over $25 for admission and only get three hours out of it. It turns out that even just a couple hours of taking in so much photography is pretty exhausting. I would divide the whole show into roughly three kinds of photography. First, and probably of the least interest to me considering my limited amount of time to see everything, were the exhibitors who showed primarily old photography: daguerreotypes, tintypes, glass plate negatives and things of that nature. Wanting to take a quick pass through everything and then go slower on my second walk-through, I pretty much just walked right by these without stopping in to look. The second group I really don't know how else to describe other than just "plain ol' contemporary photography." A lot this stuff was montage/landscape and also there was a lot of portraiture. Most everything seemed to have some sort of conceptual feel to it. All of it was printed very large and in most cases I could get a good look from the main walkway areas. Nearly all of this work was color. Lastly, and by far of the greatest importance to me, I'll just describe as "20th Century Silver Gelatin." We're talking--and this is so totally in addition to all the "big" names--Faurer, Levitt, Croner, Grossman, Heath, Stettner, Ronis, and so many others. My favorite of all these was the gut-wrenching and iconic Bourke-White that I spent an entire minute looking at in an attempt to recall who shot it (NOT Evans or Shahn) before giving up to look at the title card. Needless, there was very little in this third group of photography that I hadn't seen before. 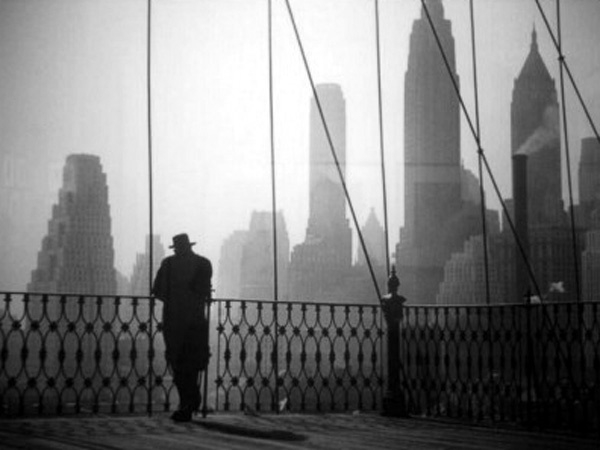 There was a photographer I came across whose name was only vaguely familiar: Paul Himmel. The booth for Keith de Lellis gallery had a gigantic print of his that I immediately fell in love with (at right, snapped with my cellphone camera). 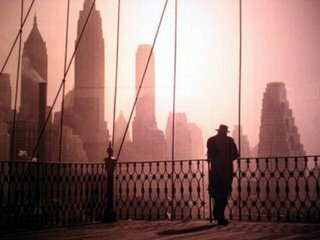 The print was huge, maybe five feet across, and there was just something dreamlike about the image, of a man standing on the Brooklyn Bridge. There was something about it that evoked memories of some 1940s New York movie I've heard of but never seen. The more I looked at it, the more I felt off-balance, almost dizzy. My eyes kept moving from the railing, to the bridge cables, to the buildings, to the direction of the sunlight. But my bearings on the image simply weren't snapping into place. The towers of 70 Pine and 40 Wall Street looked correct (though I must admit I can never remember which one is closer to the water; they're close enough to one another as it is, such that their east/west orientation kind of changes based on what angle they're being viewed from). It was the vantage from the bridge that was throwing me off. It was as if the image was made from some different bridge that connected to Manhattan much further down, via Broad or Whitehall Streets. Or if you didn't know any better it could have been made from the deck of a huge steamliner about to go up the East River. I went up to the woman working the booth and asked "Is this photo flipped?" She didn't immediately know, and I started asking others nearby but nobody seemed to care. I took a quick snapshot with my phone and went to the next booth. Anybody curious enough to know what it looks like flipped back to normal can click here. Coincidentally, I have a widelux picture taken from just a few feet away, in 2000 or so, that I've posted here. FYI, Keith de Lellis is going to have a killer show of vintage Italian street photograpy starting next week, April 24th. In all my dealings with people at the show I probably talked to maybe a dozen people. I had a great chat with Vicki Harris from Laurence Miller, who seemed delighted by my previous post about Fred Herzog. I spoke with Paul Berlanga and Stephen Daiter of Daiter's gallery in Chicago, which is where I bought my copy of "The Decisive Moment" ten years ago (that's a very interesting story, some other post). I spoke with Terry Etherton, who had lots of interesting things to say when I asked him about the Center for Creative Photography at the University of Arizona in Tuscon. He gave me a great poster promoting his gallery's publication of a limited edition print portfolio of John Loengard's "Celebrating the Negative" series. Lots of other tidbits from my two-plus hours at the armory, not all of which is worth getting into. Afterwards I decided to take a little walk eastward on 65th Street toward the M15 bus on Second. Finally on board and able to give my feet a rest, I opened the AIPAD catalog, which until that point I had been using only to mark pages with business cards I had collected. It was nice to soak in everything and a good time to review my notes. 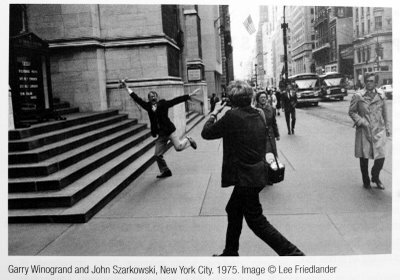 Most of all, however, I was touched to discover an opening welcome message from the Museum of Modern Art's Chief Curator of Photography, Peter Galassi, titled "Saluting John Szarkowski." 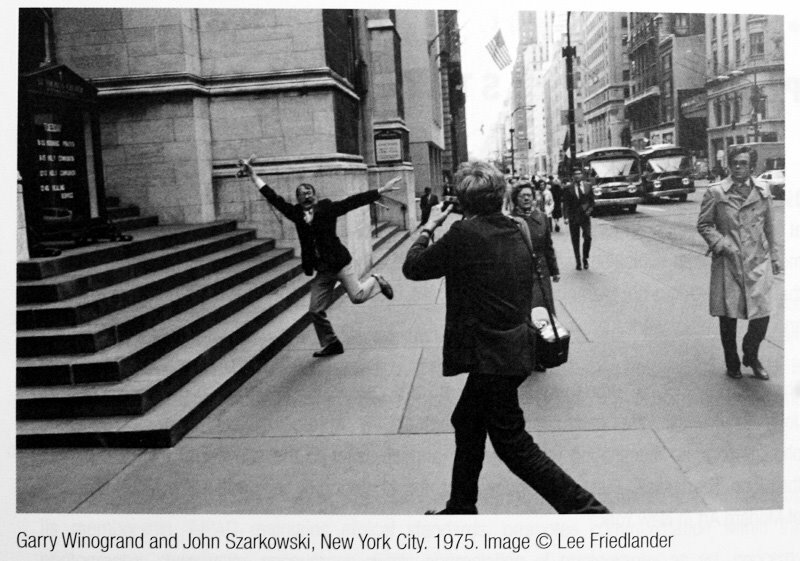 Accompanying it was a 1975 photo taken by Lee Friedlander, of Garry Winogrand photographing Szarkowski, just around the corner from MoMA.